Journal Reference: Norgren M, G de Boer, and M Shupe. 2018. "Observed aerosol suppression of cloud ice in low-level Arctic mixed-phase clouds." Atmospheric Chemistry and Physics, 18(18), 10.5194/acp-18-13345-2018. 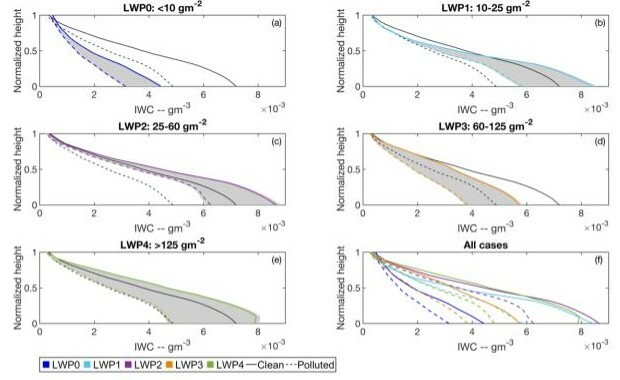 Vertical profiles of ice water content for clean and polluted conditions for five liquid water path (LWP) regimes. On the y-axis, 0 corresponds to cloud base and 1 corresponds to cloud top. The black reference lines represent the mean profiles for all the LWP bins. Grey shading represents regions of the cloud layer where there is a statistically significant difference between the clean and polluted IWC distributions. Arctic mixed-phase clouds are a significant modulator of both solar and terrestrial radiation reaching the arctic surface. The extent to which these clouds impact radiative transfer depends heavily upon the partitioning between ice and liquid water in the cloud. To understand how this phase partitioning behaves under varying aerosol conditions, we compiled a long-term record of in-cloud ice water content profiles and find statistically significant relationships where clouds associated with elevated surface aerosol concentrations have reduced amounts of cloud ice mass. This study indicates that aerosol particles generally inhibit, rather than promote, ice production in arctic mixed-phase clouds. This is a step towards characterizing the pathways of ice production that govern the macroscale properties of arctic mixed-phase clouds, and could inform the development and evaluation of the simulation of cloud radiative effects in present and future climates. A nine-year record of aerosol, cloud, and atmospheric state properties is used to quantify aerosol influence on ice production in mixed-phase clouds. Observations were made by the Department of Energy (DOE) Atmospheric Radiation Measurement (ARM) user facility situated on the North Slope of Alaska (NSA). Radar-based retrievals of in-cloud ice water content (IWC) show reduced amounts of ice mass when elevated levels of aerosol particles, measured at the surface with a nephelometer, are present. The vertical structure of the ice water mass, along with signatures in the fall speeds of ice crystals observed with Doppler radar, are consistent with two primary mechanisms leading to this reduced IWC: (1) High concentrations of scattering aerosols promote the formation of more numerous but smaller liquid cloud droplets that may be less likely than larger drops to freeze as well as lead to a less efficient riming process; and (2) Scattering aerosols interact with ice-nucleating particles by coating them, thereby reducing their effectiveness to nucleate ice crystals. The net result of either mechanism is reduced ice nucleation and secondary ice production.